Community activists, educators, and concerned parents met at AAMA high school to protest the name change of Mexican-American studies to “Ethnic Studies: An Overview of Americans of Mexican Descent”. The name change, proposed by Beaumont Republican Board of Education member David Bradley has caused friction between segments of the Mexican-American community and the Texas Estate Board of Education. 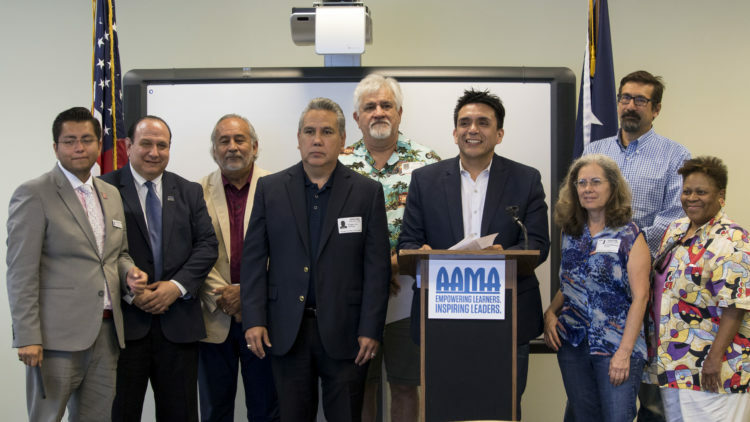 Latino activists in six Texas cities, have been organizing a movement to keep the name of the Mexican-American studies course. “I don’t subscribe to hyphenated Americanism… I find hyphenated Americanism to be divisive,” said Bradley. Tony Diaz, founder of the Librotraficante movement expressed his discontent in the name change by calling it “illogical”. The Librotraficante movement, promotes Mexican-American literature on the educational system. “It simply makes no sense. It is like calling TEX-MEX food, Texan food with Mexican ingridients,” Diaz said. The Texas State Board of Education will have full board meeting on June 12, 2018 at the Texas State Capitol, Room 1- 104. Community activists from San Antonio, Forth Worth, Houston, El Paso, Austin and San Juan Texas will caravan to the meeting to protest the name changed by Bradley. Parents have also expressed their frustration towards Bradley. Maria Delgado, a parent who attended the press conference believes the name change gives a bad message to the community. “I find it offensive how Michael Bradley changed the name without consulting Mexican-Americans”, said Maria Delgado.